Gain critical know-how for fire inspectors. 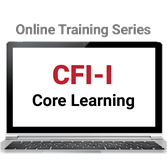 Take the CFI-I Core Learning Online Training Series -- including vital training on NFPA 13, NFPA 25, NFPA 72®, and NFPA 101®. Save time and money on must-have code training with the CFI-I Core Learning Online Training Series. In order to competently detect fire hazards in all types of occupancies, fire inspectors need to understand basic concepts in widely adopted NFPA codes and standards including NFPA 13, NFPA 25, NFPA 72, and NFPA 101. NFPA® provides the instruction that's vital for your work -- online in your own time frame -- with this new training series. Work at your own pace to gain the type of critical knowledge needed for job success, and help prepare for certifications such as the NFPA® Certified Fire Inspector I (CFI) program.